Follicular Unit Transplantation (FUE) is an extremely effective and popular solution to hair loss but the results, whilst impressive, are not immediate. Clients who are interested in pursuing this treatment may wish to familiarise themselves with the stages that their hair will need to go through before the final effect is achieved. FUE is a hair transplant technique that involves harvesting up to 4000 individual donor hair follicles from one area of the head and transplanting them into a thinning or bald area. This creates a new hairline and eventually, full hair regrowth. The procedure itself takes just one day. As the follicles are extracted individually there is less scarring to the donor area and no restrictions on how short the hair can be cut in the future. It typically produces a more cosmetically pleasing appearance. How does it differ from FUT? Another type of hair transplant technique is Follicular Unit Transplant. This technique is usually cheaper and does not provide such good results cosmetically as there is scarring to the donor site. During a FUT procedure a strip of hair is removed, and the scalp sutured together using a trichophytic closure to minimise scarring and to allow hair to grow through the scar tissue. The strip is then dissected into individual follicles which are implanted into the bald areas. When will I start to see results after FUE? Your new hairline will be apparent immediately – but it may be swollen and scabbed. The donor site may also have swelling. Your surgeon will advise on a post-surgery care regime, typically you are advised to sleep with your head elevated on pillows for the first night or two. You can return to work straight away, but many people prefer a longer period of time. Around a week after treatment the initial post-surgery redness, swelling and scabbing will subside and by day 10 the grafts should be firmly in place. This means that you can resume your usual washing, combing and cutting regime. It is advised to wait a month until starting chemical treatments such as colouring your hair. It’s all falling out! Help! You may be alarmed to see that you start shedding hair within the first few weeks and your hair begins to look as it did pre-transplant. This is completely normal due to the follicle going into a dormant phase after being briefly starved of blood supply. It is only the hair that you are losing, not the follicle itself. It is the follicle which enables growth so as long as this is intact, hair growth will follow. Once the follicle has recovered from the transplant it will begin to grow. Hair only grows at around 1cm per month, so it will take a few months for your new head of hair to become a reality. I’m spotty! Is it infected? What’s going on now? As the hair begins to grow after 3 months or so, your scalp may become spotty and develop an acne like appearance. This is a good sign as it means that the hairs are trying to push their way through but may be getting trapped, a little like an ingrowing hair. The first hairs that you see may be very fine and even colourless, but they will begin to get thicker and fuller. The growth may even be a little patchy, but this is all part of the initial growth process and will even out over time. The majority of new hairs will appear at around 5 or 6 months and at 8 to 10 months the hair will be at its longest and thickest as the follicles reach maturity. You can expect the final results at around one year, but this can take up to 18 months and following that the colour and texture may continue to develop and change slightly. Everyone is different and experiences different rates of hair growth, so all time frames are based on average experiences. The one thing we are certain of is that the results will be worth waiting for. Can I encourage my hair to recover faster? Following your post-transplant advice carefully is one of the best ways to ensure the success of the transplant. 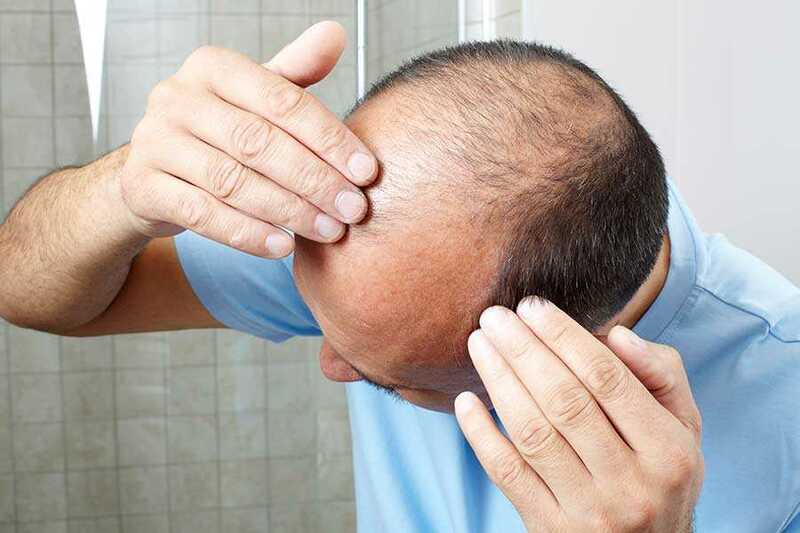 Here at the Wimpole clinic we have been treating baldness and thinning hair for decades and have a range of treatments to rejuvenate your scalp and follicles. Vitamin therapies counteract imbalances and deficiencies that your body may not be suffering from but that show up in the texture or thickness of your hair. At the Wimpole Clinic in London with have over 30 years of experience and pride ourselves on keeping up to date with the latest research and methods. This means we are perfectly placed to answer any queries you may have about the FUE procedure. So why not give us a call today?